Touching lips with a stranger is one of the main reasons a person with CPR training refuses to provide CPR to a victim. And who can blame them? Performing mouth-to-mouth puts your own well-being at risk. However, multiple studies have proven chest-compression-only-CPR can be just as effective as CPR with rescue breathing when it comes to cardiac arrest. Problem Solved! If someone suddenly collapses or goes into cardiac arrest, call 9-1-1 and start chest compressions immediately. If you know the victim’s collapse was breathing related, rescue breathing may be needed. Do I have to Be CPR Certified to perform CPR? Absolutely not! Unfortunately, it’s not uncommon for people to think a license is required to perform CPR, which can ultimately deter them from taking action. The Good Samaritan Law helps protect those attempting to provide assistance to those in need, at least from a liability standpoint. We recommend getting CPR Certified and at the very least getting some degree of formal CPR training, but you don’t need a certification or formal training to legally perform CPR on a victim. If you know how to give chest compressions to the beat of Staying Alive and know how to identify someone in need of CPR, there isn’t a lot of harm you can do by trying. What if I Crack a Rib During CPR? Fear of further injuring a person is another common reason people give for not administering CPR on a victim. If a person doesn’t have a pulse, every second counts. Don’t worry about cracked ribs, and besides, most of the popping noises you hear are just coming from the joints. Ribs heal. The alternative is far more permanent. Have you ever tried holding your breath as long as you can? Imagine how excruciating those last few seconds feel before taking a big gasp for air. When the heart stops beating, every cell in the body is going through a similar struggle, ‘gasping’ for oxygen. The brain needs oxygen to function. The act of CPR keeps oxygenated blood flowing to the brain. Without oxygen, this vital organ can become permanently damage in less than 10 minutes. Rescue breathing is the practice of manually putting oxygen into a victim’s lungs when their body isn’t able to complete the task on its own. This is accomplished using either mouth to mouth breathing, breathing pumps, or a machine. The goal of rescue breathing is to add oxygen to the body when the victim can’t breathe on their own or doesn’t have enough oxygen in their lungs to sustain life. If a victim needs to get oxygen into their lungs, you breathing that life might be their only hope. Fortunately, many first aid kits include an emergency rescue breather that helps prevent the transmission of fluids. According to the American Heart Association (AHA), one rescue breath can be given every 6 to 8 seconds and the breath should take approximately 1 second to administer. Giving too many CPR rescue breaths, or what the AHA refers to as “excessive ventilation,” is not recommended. Try to focus on quality over quantity when it comes to your rescue breathing. Hands-only is referred to as ‘bystander CPR,’ because this is specifically for untrained bystanders who witness a cardiac arrest emergency. 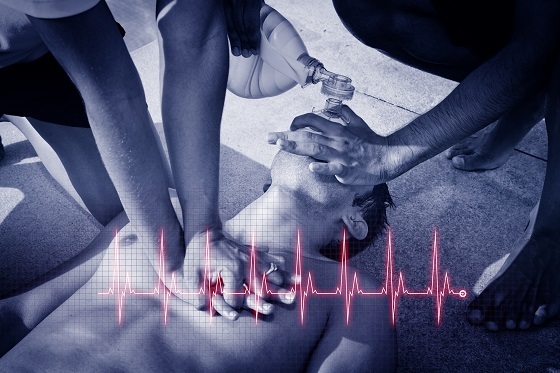 CPR trained medical professionals use rescue breathing during a cardiac arrest in combination with chest compressions depending on the emergency and as dictated by the emergency and their specific training. A bystander’s job is simply to do chest compressions until a professional arrives. While rescue breathing is no longer required in layperson CPR emergencies for heart attack victims, there are still a number of emergency scenarios in which a victim will need rescue breathing, so don’t just assume the victim is suffering from cardiac arrest. 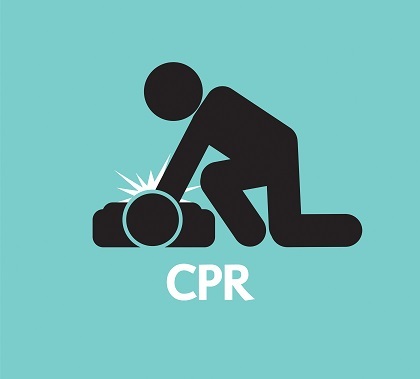 According to the American Heart Association, performing chest compression only CPR for a cardiac arrest has the same statistical odds of saving a person’s life as CPR with rescue breathing. But it’s important to keep in mind what emergencies require rescue breathing. Not requiring mouth-to-mouth will hopefully increase the percentage of bystanders that are willing to step up to the plate and administer CPR in a cardiac arrest emergency. For emergencies that require rescue breathing, we can only hope bystanders are willing to help. Contact the Response Institute to learn more about formal CPR training or certification.